tell you when the lower speed limit is in effect. The next time you’re driving through a school zone, put yourself in the shoes of the students getting on or off the bus and crossing the streets and you’ll know it is a highly unpredictable driving situation. You’ll see extra heavy traffic of parents picking up their kids and the students crossing the street on foot and on their bicycles. After you take in the scene of the organized chaos, you’ll understand why school zone speed limits are strictly enforced. Why is it so difficult for children to see motorists? Because their peripheral vision is about one-third narrower than an adult’s, children can’t see a motorist approaching from the right or left as soon as an adult can. Children also have difficulty judging a car’s speed and distance. They often think that if they can see the driver, the driver can see them. Drivers should observe speed limits at all times, but especially around children. You were taught during driver education class to always expect children to dart out in the roadway or be unpredictable. So, the next time you’re out expect the unexpected when driving in school zones, near playgrounds, or in neighborhoods where children might be playing and SLOW DOWN. Always yield to pedestrians. When turning left at a green light or making a right turn on red, drivers need to look for pedestrians as well as cars. Pedestrians always have the right of way in these situations. When a school bus stops you must stop. Never pass a school bus that is loading or unloading children. Passing a stopped school bus is a four point infraction and is very dangerous. Around most schools the speed limit is either 15 or 20 mph. Special speed limit signs are posted around schools to alert one as they enter the zone. These signs have flashing lights to tell you when the lower speed limit is in effect. There is also a sign to indicate when you have left the school zone. Additional School Bus Safety Tips for Parents and Children. The extreme heat and drought hitting the nation this summer is taking its toll on cars. Long trips with outside temperatures nearing or over 100 degrees means your car’s cooling system has to work harder to keep the engine cool. Along with frequent oil changes, including your car's cooling system as part of the routine maintenance on your vehicle is critical to ensure that your car's engine won’t be damaged by overheating. The last thing you want to have happen is to be stuck by the road in the summer heat while a plume of steam pours out from under your hood. Make sure that the radiator core is in good shape. In areas of the country where roads are salted, the core of the radiator can literally rot away. Have your radiator core checked by an expert mechanic. To prevent the radiator core from getting plugged up by gunk in your cooling fluid, have your cooling system flushed on a regular basis. Visually check the hoses and belts related to the cooling system. Squeeze the hoses and look for small cracks in the rubber. Make sure the hoses are tight (grab the hose near the hose clamp and make sure it doesn't rotate). Check to see that the belts have the proper amount of tension. To check the tension, push down on the belt. It should deflect about 1/2 inch. On some cars--mostly older ones--a belt turns the fan. Use antifreeze in your radiator, even in the summer, because antifreeze contains corrosion inhibitors, and it actually has a higher boiling point than water. If you haven't had your thermostat replaced in several years, get a new one when you're having your cooling system flushed. A stuck thermostat is a common cause of engine overheating and replacing it is cheap. Check the operation of the fan by driving the car for up to 20 minutes so the fan will kick in. Open the hood, with the engine running, and listen for the cooling fan. If the fan isn't running, it's not working. Have it fixed--sometimes the fan has gone south, and other times the problem is the coolant temperature sensor. Your coolant also runs through your heater core. Have the heater core checked for leaks by a qualified mechanic. Slow down on hot days, especially if you are pulling a trailer; to lessen the load on your engine. If the temperature gauge shows the engine temperature rising, turn off the air conditioner and turn on the heater. The heater may make conditions unbearable inside the car but the extra radiator in the heating system may help to prevent an engine meltdown. An extra container of anti-freeze. A roll of duct (or duck) tape for temporary patches to leaking hoses. A screw driver and a pair of pliers. If your temperature gauge goes into the red zone or you get an overheat light, stop the car and turn off the engine. If you try to locate the source of the trouble yourself, use caution. Visually check for a leak but don’t try to feel for one. Steam escaping under pressure from a pinhole leak can do a lot of damage to your skin. Don’t try to take the cap off the radiator. The escaping steam pressure can cause severe burns on your face and body. Most modern cars have a cooling fluid overflow reservoir. It is generally made of opaque plastic and indicates where the coolant level should be when the engine is warm or cold. Use the reservoir to add new fluid to the cooling system; not the radiator cap. To prevent burns, wait for the engine to cool somewhat before attempting tape repairs on cooling hoses. If adding extra coolant or taping a hose doesn’t work, call for a tow-truck! Don’t try to push the car to the next exit. Doing that could cause the head gasket to blow or crack your cylinder head. A little inconvenience or time lost isn’t worth the risk of having to replace the engine. Traffic school already saves you money, if you think about it: fewer points on your driving record means less insurance premiums to pay for. But what if the whole experience was taken online? Will it save you more money? Absolutely. Present technology has made the online experience better: faster connection speeds allow us to experience things that would normally be out of reach. 100% online - You don't even have to leave the house. No gas or traveling money required! Just an internet connection, a computer and that's it! No more repeating traffic school if you could repeat the lessons and learn at your own leisure, in your own home! Future-proofing your driving - If you learn the basics early on, you’re set on carrying those lessons every time you start up the engine. If you learn the proper way to drive, you’ll face less problems on the road, like crashes, which cost a lot of money, not including the paperwork and insurance fees you have to deal with after. A few dollars for a lifetime of safety --- that's a bargain in and of itself. Passing the first time - It's no secret: taking driving tests usually have fees attached to them. If you only have to take it once and pass, then you wouldn’t have to spend more. It’s as simple as that. Lower insurance premiums – Most of the time, insurance companies feature traffic school-related incentives for drivers who choose to voluntarily take traffic school. These discounts could add up to hundreds of dollars over the years, even more if you get a "safe driver" status. The BOLT Driven to Distraction Infographic explains through images the dangers of distractions while you are driving. Every time you get behind the wheel, you are faced with many potential distractions from the radio, to your passengers, your cellphone, to your fast food. All of these distractions can add up to disaster in a split second. In 2009, from driver distractions nearly 5,500 people were killed, and another 448,000 were injured. Presented as an infographic (created for BOLT by Infographic World) to help you more easily visualize and retain this important information on the dangers and risks of driving while distracted! Two studies published in 2009 showed that teens who had to share a car and whose parents who were involved in their driving in a supportive way were far less likely to be involved in a crash or to engage in risky driving behaviors. The studies, conducted by Children's Hospital of Philadelphia (CHOP) and State Farm Insurance, were published in the October 2009 issue of Pediatrics. According to a news release by State Farm Insurance, the studies were based on a National Young Driver Survey of more than 5,500 teenagers in grades 9 through 11. These findings are compared to teens who said their parents were less involved." The second study looked at teens who either owned their own car or had easy, unrestricted access to a car were twice as likely to be involved in a crash. The study showed that almost 75% of teen drivers owned or had unrestricted access to a car. 25% of teens who were the main driver of a car reported having been involved in a collision compared to just 10% of those who had to borrow a car. On a basic level it makes sense; a teen that has to borrow a car faces the wrath of the owner if that car is damaged or destroyed. Teens who own their own car don't feel that sense of responsibility to protect someone else's property from harm. These studies show the critical importance of parental involvement in a teen's driving environment and add to data that shows Graduated Drivers Licenses for teens work to create a safer driving environment for teens. Car crashes are the main cause of death for teenagers in the United States. According to the National Highway Traffic Safety Administration (NHTSA), teens are involved in three times as many fatal traffic crashes as all other drivers. Traffic crashes are the leading cause of death for 15 to 20 year olds. 5,148 15- to 20-year-old drivers were involved in fatal crashes. 2,336 15- to 20-year-old drivers were killed. 196,000 15- to 20-year-olds were injured in motor vehicle crashes. 15 to 20 year old drivers make up 6.4% of the licensed drivers in the US but they account for 11% of the fatal crashes. "Our data show that one of the safest decisions families can make is for parents to control access to the keys for at least the first 6 to 12 months after a teen gets his license," says Flaura Koplin Winston, MD, PhD, study co-author and scientific director of the Center for Injury Research and Prevention at CHOP. "Our data show an alarming trend - almost three-quarters of teens have easy access to a car. Compared to teens that have to share a car, these teens are twice as likely to crash and more likely to speed and to use a cell phone while driving. When teens have to ask for the keys before taking the car, it naturally creates the opportunity for parents to have conversations with their teens about where they are going, who they will be with, and to review the house rules about driving with passengers, wearing seat belts, using cell phones, and which routes are safe." A dialogue should be started with the teen before they receive their learner's license and an effective tool for setting up those rules and boundaries is the Parent-Teen Driving Contract. When parents and teens both agree on what the rules should be, the teen is more likely to take ownership of that decision. 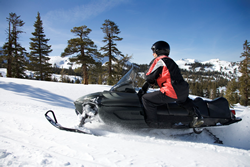 Winter is here and one of the more popular wintertime activities is snowmobiling. Snowmobiling has grown in popularity because snowmobiles aren't limited to ski resorts or skating rinks. Snowmobiles are large, powerful machines, weighing around 600 pounds and capable of obtaining speeds up to 90 mph and, just as with any other type of motor vehicle, snowmobiles have their dangerous side. Unlike other motor vehicles with seat belts and roll cages, the only protection available on snowmobiles is a small windscreen. National figures are hard to come by but one study estimates that there are up to 14,000 injuries and 200 deaths per year in the US. Several states publish annual statistics on snowmobile incidents and they can provide some idea of the number of serious incidents involving snowmobiles each year. The New York State Office of Parks, Recreation and Historic Preservation (OPRHP) post injury and fatality figures for each snow season. From 1997 through 2010, New York there were a total of 4,946 snowmobiling collisions with 216 fatalities. During the 2009 – 2010 season there were 294 reported accidents resulting in 237 injuries, and 14 fatalities. Unsafe speed, riding too fast for weather and/or trail conditions was listed as the most common cause of most of the incidents. More than 76 percent of the recorded incidents resulted in collisions, most often with trees. After collisions with other objects, the next most common reason for injuries was falling off the vehicle. Twelve percent of the snowmobile incidents involved the use of alcohol. Alcohol use was involved in 43 percent of the fatal incidents. Almost half of the fatalities occurred on straight roadways. Sixty four percent of the fatalities occurred in clear weather conditions. Males, between the ages of 19 and 30 made up the largest portion of snowmobile operators. The most dangerous months for snowmobile incidents are January and February. Among all states reporting, a surprising number of snowmobile operators drowned while attempting to cross a frozen lake or stream. Complete a NYS Snowmobile Safety Course. This course helps establish a safety mindset and provides basic knowledge in safe, legal and ethical operation. Visit www.nysparks.com to find a course near you. Use the highest degree of caution while traveling across frozen waterways. Check local ice conditions, carry or wear a floatation device, limit travel at night and if you DON'T KNOW, DON'T GO. Use the buddy system; never ride alone. Don't drink and ride. Alcohol affects a person’s reaction time and judgment. Wait until you're done riding for the day before consuming any alcoholic beverages. If not for yourself, do it for your family and friends. Slow down. High speed operation leaves little room for mistakes and greatly increases stopping distances. Many snowmobile fatalities could have been prevented if the operators were only going slower. Nighttime speeds above 40 mph cause operators to override their headlamps. At this speed, operators have little chance of avoiding a hazard once it is illuminated by their headlamps. When riding in groups, always maintain a safe following distance of 2-3 seconds. Increase your following distance when travelling at night or when experiencing snow dust. Respect private property. The majority of the snowmobile trails in NY are on private property. Snowmobile clubs invest much time and effort to set up agreements with landowners each year. Riding outside the marked trails on private property is trespassing and has caused landowners to close their properties to trails, sometimes forever. Stay within the marked trails and don't cut corners. Do you feel that drivers drive too fast through your neighborhood, creating hazardous conditions for you and your neighbors? If so, the New York Department of Transportation (NYDOT) has a program that may be able to help. Called "Neighborhood Slow Zones", this program allows neighborhoods to apply for construction of traffic calming devices within a neighborhood that force drivers to slow down. Neighborhood slow zones are established in small, self contained neighborhoods and they force drivers to slow down through the use of speed bumps, signs and other traffic calming devices. To apply as a Neighborhood Slow Zone, residents must fill out an application available at the NYDOT website. The neighborhood must be small, self contained, (approximately one-quarter square mile in area) and can't contain any major thoroughfares or commercial and industrial zones. The application must be submitted by a neighborhood board, community association, or business coalition. The application must be endorsed by civic or business leaders within the community. If the application is approved, NYDOT will work together with community leaders to design the most effective means of traffic calming for the neighborhood. There is a deadline for the application so neighborhood organizations that wish to apply must do so by February 3rd, 2012. Once the application is received, NYDOT will conduct a review during the month of February and those neighborhoods which are approved will learn of the approval in March.